BAGHDAD — For the first time, Iraqi forces engaged Islamic State fighters within the city center of Ramadi on Tuesday, reaching the edge of the inner government district in an attempt to seize the critical western provincial capital after months of approach and maneuvering, officials said. Six hundred to 1,000 Islamic State fighters were said to have been in Ramadi when the overall offensive began two weeks ago, but several hundred of them have been killed in fighting and airstrikes since then, according to Iraqi and Western officials. Those remaining did not appear to be giving up easily. Iraqi forces, including a mix of soldiers and policemen along with a contingent of Sunni tribal fighters, faced heavy fire and were assaulted by car bombs, Iraqi officials said. And fighters for the Islamic State destroyed three bridges over the Euphrates River to slow the security forces’ advance, according to Gen. Ahmed al-Belawi, the leader of a battalion of Sunni tribal fighters. The force crossed on Tuesday using portable bridges supplied by American forces, officials said. If the Iraqi forces manage to fully reassert control over Ramadi — the provincial capital of Anbar Province, in the Sunni Arab heartland — it would be the most important of a series of military setbacks for the Islamic State since its explosive expansion across Iraq that began with the capture of Mosul last year. In early April, Iraqi forces and Shiite militias drove the Islamic State out of the city of Tikrit, and in October retook control of the northern city of Baiji and its oil refinery. Last month, Kurdish and Yazidi forces assaulted the northern city of Sinjar, driving out fighters with the Islamic State, also known as ISIS or ISIL. The capture of Ramadi, 60 miles from Baghdad, would give the government of Prime Minister Haider al-Abadi a badly needed morale lift, and a successful cooperative effort with the country’s alienated Sunnis. But more important, it would allow his often disparaged military to reverse a humiliating loss. Ramadi fell to the Islamic State in May, in a sudden collapse after a long battle that exposed multiple weaknesses in the government’s ability to fight the militants, including stark military shortfalls and disorganization, and an unwillingness by the government to arm or send reinforcements to help Sunni tribesmen who were fighting the militants. 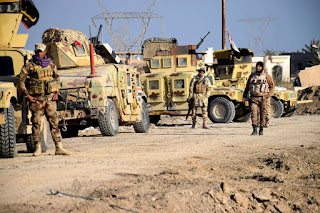 The rapid advances on Monday and Tuesday held out hope that after months of preparation, the government had finally marshaled a large enough force to prevail in Ramadi and begin a wider operation to fight the Islamic State in other areas of Anbar Province. Other crucial battles, like the ones for Tikrit and Baiji, dragged on for weeks or months, and it remained to be seen whether the Islamic State would quickly melt away. Over the past month or so, Iraqi security forces and tribal fighters have encircled Ramadi. Two weeks ago, they seized a large neighborhood, Tamim, on its southwestern outskirts. Al Jazeera reported that 14 soldiers and 17 tribal fighters were killed by a suicide car bomber in Albu Diab, northwest of the city center, and that at least 12 militants had been killed. MSNBC released a video that it said showed an Islamic State counterattack on the eastern edge of the city, and it quoted a tribal fighter saying that at least seven Islamic State militants had been killed. Those casualty numbers could not be independently confirmed. Iraqi airplanes dropped leaflets on Sunday urging residents of Ramadi to evacuate within 72 hours, warning of an impending operation and suggesting two evacuation routes. Colonel Warren estimated that thousands or even tens of thousands of civilians were still in the city; hundreds of thousands have fled. In a telephone briefing on Tuesday, Colonel Warren said that coalition forces had recovered what he said were Islamic State leaflets in the nearby city of Falluja urging its fighters — if they lose control of the city — to impersonate Iraqi security forces and commit atrocities. The authenticity of the leaflets could not be independently confirmed, and experts on the Islamic State were debating their validity after the coalition publicized them on Tuesday. SITE, a research group that monitors jihadist communications, said that on Tuesday, some supporters of the Islamic State were seeking to play down the importance of the Ramadi battle, circulating photographs that it said showed a calm city. The official, who spoke on the condition of anonymity because he was not authorized to discuss military operations, added that the Iraqi forces, entering from the southeast of Ramadi, were within two miles of the city center, where the local government compound is. The official added that the suburb of Bakir had been “completely devastated” from airstrikes and shelling. Since the middle of 2014, the Islamic State has controlled perhaps one-third of Iraq, including the northern city of Mosul. But it has lost several towns in recent months after the government in Baghdad and in the autonomous Kurdish region in northern Iraq began to fight back. President Obama said recently that the militant group had lost 40 percent of the Iraqi territory it had seized, as the United States and its allies have intensified their airstrikes against the group. On Monday, Mr. Abadi said that he had agreed to the deployment of 200 American ground troops in Iraq to help with operations against the Islamic State. Even if the Iraqi military finally does reclaim Ramadi from the Islamic State, regional experts warn, the Sunni city will not take kindly to being overrun by the Shiite-dominated Iraqi military. The Pentagon has been training Sunni tribal fighters to make up a holding force for the city. Defense Secretary Ashton B. Carter had offered to deploy Apache attack helicopters to aid the Iraqi government’s effort. But so far, Mr. Abadi, under pressure from Shiite groups and Iran to keep the United States at a distance, has not accepted the offer, Iraqi officials said. To make gains in Anbar Province, the United States has urged Mr. Abadi’s government to reach out to Sunni tribal fighters trained and equipped by the United States. Although the Shiite militias are among the most effective of Iraq’s military forces — playing a crucial role in retaking northern cities like Tikrit and Baiji — they have been kept out of the Ramadi fight for fear of alienating the local population.